Good Lord, today feels like a Monday. One thing right after the other! Now let me explain what's going on in this photo - my friend Carlee and I were partners for a video book report project for our English class. Carlee's family is among the coolest and creative families I've ever known, so between me, Carlee, her fun mom and my crazy mom, we ended up going all out. The plot of the book (I can't even remember what the book was) sounded like perfect fodder for two country grandmas sitting around gossiping, so that's what we did for our report. 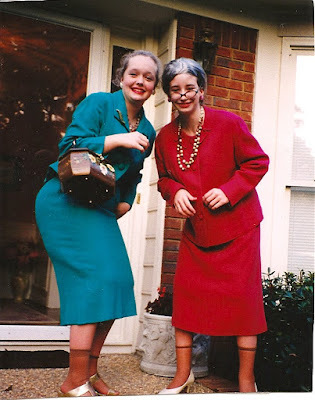 We dressed up as old ladies and discussed the book's main character as if she was a granddaughter of a friend of ours - there was a lot of "I declare!" and "bless her heart" going on. Carlee stuffed her rump with a pillow to achieve that old lady shape (resulting in the perfect old lady waddle) and notice we've both got the old lady hunch going on. We're wearing her grandma's suits, Carlee is holding my mom's decoupage wooden purse and I have on her old cat's eye glasses. She powdered her hair and I have on a wig. And don't miss our pantyhose and shoes. Now if that doesn't brighten your day a little bit, I don't know what will. Thank goodness for incriminating photos. Hahaha! I remember when you did that!